Craft Heads Brewing Company is turning 4 and are offering a party with wild beer and great music. The downtown Windsor brewery is adventurous with their creations (they attempted a shawarma beer) and will be offering some crazy beers to celebrate. Things will kick off on Friday, February 22, 2019. Choose from an insane amount of options as they’re serving 36 taps and 2 casks for your drinking pleasure. They’re slowly releasing some of the brews that will be featured that evening. One of the first special beers announced is a cask called the Worldwide Breakfast Stout. It’s an Imperial stout aged on Brazilian coffee, Mexican vanilla, Guatemalan cocoa nibs, Canadian whisky oak chips and Canadian maple syrup. Some of the other fun creations we know will be flowing are wood-aged sours, large hoptron collider, and some wine-beer hybrids. 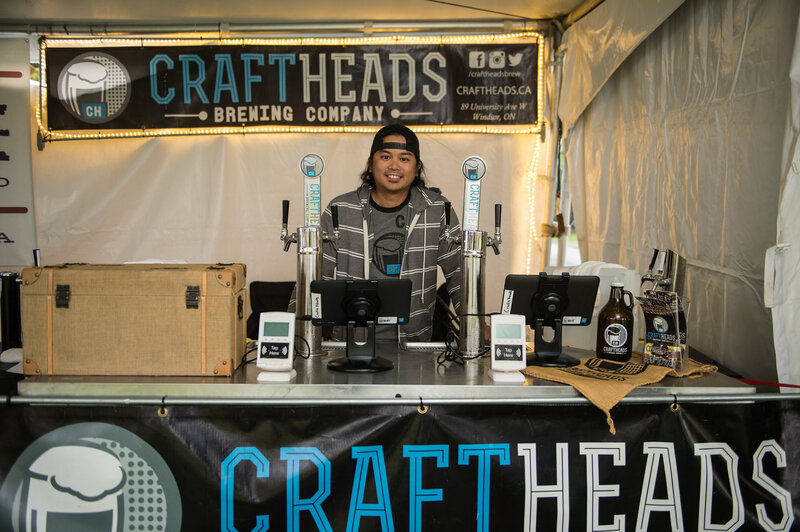 Bryan Datoc of Craft Heads Brewing Co. at the 2017 Windsor Craft Beer Festival. “Zest” is a double dry-hopped IPA brewed with the juice and fresh zest of naval oranges, sweet clementines, blood oranges, grapefruit, honey tangerines and mandarin oranges. The name says it all… Loco Coco Brown – a brown ale brewed with CRAZY amounts of toasted coconut flakes. Maltiness upfront collides with a lingering bitterness on the back end. Dry, slightly hoppy, hints of stone fruit. Kveik, pronounced ‘kwie-ick’ in English is an ancient Norwegian yeast able to produce a beer from brew to glass in just 7 days (ales ~ 16 days. lagers ~42 days) even at extremely warm temperatures. This beer was brewed on Feb 15, 2019 and will be served on tap at Craft Heads 4 Year Anniversary Party this weekend! Collaboration with Chapter II Brewing Co. This is the first (from our understanding) kettle soured beer using a live sour dough culture. Putting a new twist on a pint of Neapolitan! This cask served Imperial Stout is aged on cocoa nibs, vanilla and strawberry puree! Each year we will source different ingredients from various parts of the world and combine them to make a unique birthday beer poured from a cask. This years Imperial Stout was aged on Brazilian coffee, Mexican vanilla, Guatemalan cocoa nibs, American whiskey oak chips and pure Canadian maple syrup! Pale ale aged on local Mastronardi Cabernet Sauvignon skins and house culture of Brettanomyces Yeast (pH 3.8) (funk and a touch of sourness). Aged on local Mastronardi Cabernet Sauvignon skins and North 42 Riesling skins, stems and seeds with a house culture of Brettanomyces Yeast (pH 3.69) (complex funkiness with dry finish). German Style Berliner Weisse aged for a year and an addtional 4 months on North 42 Riesling skins, stems and seeds (pH 3.81) Sharp acidity that lingers. German Style Berliner Weisse aged on raspberry puree. Complex acidity and depth of flavour. Dry, slightly tart and a hint of funk. Malty and with a touch of funk. There will also be some great acoustic music. A.J. Vanden Berghe from 5:00pm to 8:00pm before TEO gets people bouncing with some disco, funk and soul starting at 9:00pm. The party continues into Saturday with Adam Mailloux doing an acoustic set from 5:00pm to 8:00pm. After, one of our favourites, Datsunn & Zillie Holiday, will turn it up with some hip hop, beats and soul.